This application is a continuation of co-pending U.S. patent application Ser. No. 11/116,787, filed on Apr. 28, 2005, which is a continuation of U.S. patent application Ser. No. 10/177,691, filed on Jun. 21, 2002, now issued as U.S. Pat. No. 6,894,014, which claims priority to U.S. Provisional Application Ser. No. 60/300,116 filed on Jun. 22, 2001; and which is a continuation-in-part of U.S. patent application Ser. No. 09/849,843, filed on May 4, 2001, now issued as U.S. Pat. No. 6,939,837, which claims priority under 35 USC 119(e) to U.S. Provisional Application Ser. No. 60/209,250 filed on Jun. 5, 2000. The present invention provides compositions which exhibit improved cleaning of soils (i.e., removal and/or reduction of soils) from and/or care of and/or treatment of fabric articles. These benefits may be delivered to the fabric article treated by the compositions of the present invention while maintaining excellent fabric care properties. while maintaining excellent fabric care properties. D″ is R6 2SiO2/2 wherein R6 is independently H, a monovalent hydrocarbon group or (CH2)l(C6H4)m(A)n-[(L)O-(A′)p-]q-(L′)rZ(G)S, wherein l is 1-10; m is 0 or 1; n is 0-5; o is 0-3; p is 0 or 1; q is 0-10; r is 0-3; s is 0-3; C6H4 is unsubstituted or substituted with a C1-10 alkyl or alkenyl; A and A′ are each independently a linking moiety representing an ester, a keto, an ether, a thio, an amido, an amino, a C1-4 fluoroalkyl, a C1-4 fluoroalkenyl, a branched or straight chained polyalkylene oxide, a phosphate, a sulfonyl, a sulfate, an ammonium, and mixtures thereof; L and L′ are each independently a C1-30 straight chained or branched alkyl or alkenyl or an aryl which is unsubstituted or substituted; Z is a hydrogen, carboxylic acid, a hydroxy, a phosphato, a phosphate ester, a sulfonyl, a sulfonate, a sulfate, a branched or straight-chained polyalkylene oxide, a nitryl, a glyceryl, an aryl unsubstituted or substituted with a C1-30 alkyl or alkenyl, a carbohydrate unsubstituted or substituted with a C1-10 alkyl or alkenyl or an ammonium; G is an anion or cation such as H+, Na+, Li+, K+, NH4 +, Ca+2, Mg+2, Cl−, Br−, I−, mesylate or tosylate. In another embodiment embodiment, alkyl chain contains branching that may help lower the melting point. (3) The DEQA actives described hereinabove also include the neutralized amine softening actives wherein at least one R group is a hydrogen atom. A nonlimiting example of actives of this type is the chloride salt of (unsaturated alkoyloxyethyl)(unsaturated alkylamidotrimethylene)methylamine. Other examples of suitable amine softening actives are disclosed in PCT application WO 99/06509, K. A. Grimm, D. R. Bacon, T. Trinh, E. H. Wahl, and H. B. Tordil, published on Feb. 11, 1999, said application being incorporated herein by reference. 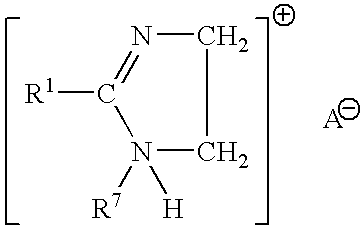 Examples of Compound (5) are dialkylenedimethylammonium salts such as dicanoladimethylammonium chloride, dicanoladimethylammonium methylsulfate, di(partially hydrogenated soybean, cis/trans ratio of about 4:1)dimethylammonium chloride, dioleyldimethylammonium chloride. Dioleyldimethylammonium chloride and di(canola)dimethylammonium chloride are preferred. 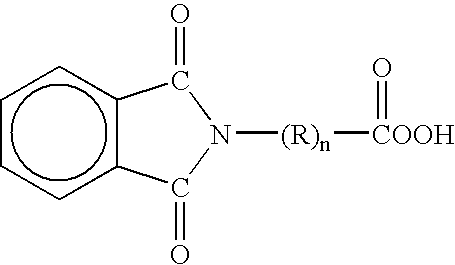 An example of commercially available dialkylenedimethylammonium salts usable in the present invention is dioleyldimethylammonium chloride available from Witco Corporation under the trade name Adogen® 472.
wherein each R′ and R″ is independently selected from the group consisting of 12-30 C atoms or derived from tallow, coconut oil or soy, X═Cl or Br, Nonlimiting examples include: didodecyldimethylammonium bromide (DDAB), dihexadecyldimethyl ammonium chloride, dihexadecyldimethyl ammonium bromide, dioctadecyldimethyl ammonium chloride, dieicosyldimethyl ammonium chloride, didocosyldimethyl ammonium chloride, dicoconutdimethyl ammonium chloride, ditallowdimethyl ammonium bromide (DTAB). Commercially available examples include, but are not limited to: ADOGEN, ARQUAD, TOMAH, VARIQUAT. 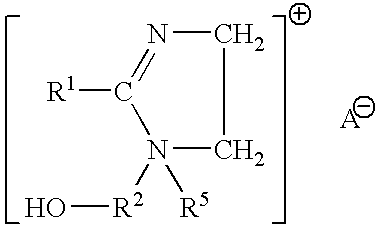 wherein R1 is C8-C16 alkyl, each of R2, R3 and R4 is independently C1-C4 alkyl, C1-C4 hydroxy alkyl, benzyl, and —(C2H40)x H where x has a value from 2 to 5, and X is an anion. 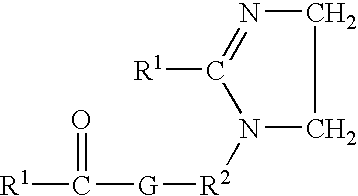 Not more than one of R2, R3 or R4 should be benzyl. Compositions according to the present invention may further comprise a polar solvent. Non-limiting examples of polar solvents include: water, alcohols, glycols, polyglycols, ethers, carbonates, dibasic esters, ketones, other oxygenated solvents, and mixtures thereof. Further examples of alcohols include: C1-C126 alcohols, such as propanol, ethanol, isopropyl alcohol, etc . . . , benzyl alcohol, and diols such as 1,2-hexanediol. The Dowanol® series by Dow Chemical are examples of glycols and polyglycols useful in the present invention, such as Dowanol® TPM, TPnP, DPnB, DPnP, TPnB, PPh, DPM, DPMA, DB, and others. Further examples include propylene glycol, butylene glycol, polybutylene glycol and more hydrophobic glycols. Examples of carbonate solvents are ethylene, propylene and butylene carbonantes such as those available under the Jeffsol® tradename. Polar solvents for the present invention can be further identified through their dispersive (δD), polar (δP) and hydrogen bonding (δH) Hansen solubility parameters. Preferred polar solvents or polar solvent mixtures have fractional polar (fP) and fractional hydrogen bonding (fH) values of fP>0.02 and fH>0.10, where fP=δP/(δD+δPδH) and fH=δH/(δD+δP+δH), more preferably fP>0.05 and fH>0.20, and most preferably fP>0.07 and fH>0.30. Suitable finishing aids include, but are not limited to, finishing polymers; such as synthetic or natural polyacrylates or starch carboxymethyl cellulose or hydroxypropyl methyl cellulose, odor control agents, odor neutralizers, perfumes, properfumes, antistatic agents, fabric softeners, insect and/or moth repelling agents and mixtures thereof. D″ is R6 2SiO2/2 wherein R6 is independently H, a monovalent hydrocarbon group or (CH2)l(C6H4)m(A)n-[(L)o-(A′)p-]q-(L′)rZ(G)s, wherein 1 is 1-10; m is 0 or 1; n is 0-5; o is 0-3; p is 0 or 1; q is 0-10; r is 0-3; s is 0-3; C6H4 is unsubstituted or substituted with a C1-10 alkyl or alkenyl; A and A′ are each independently a linking moiety representing an ester, a keto, an ether, a thio, an amido, an amino, a C1-4 fluoroalkyl, a C1-4 fluoroalkenyl, a branched or straight chained polyalkylene oxide, a phosphate, a sulfonyl, a sulfate, an ammonium, and mixtures thereof; L and L′ are each independently a C1-30 straight chained or branched alkyl or alkenyl or an aryl which is unsubstituted or substituted; Z is a hydrogen, carboxylic acid, a hydroxy, a phosphato, a phosphate ester, a sulfonyl, a sulfonate, a sulfate, a branched or straight-chained polyalkylene oxide, a nitryl, a glyceryl, an aryl unsubstituted or substituted with a C1-30 alkyl or alkenyl, a carbohydrate unsubstituted or substituted with a C1-10a alkyl or alkenyl or an ammonium; G is an anion or cation such as H+, Na+, Li+, K+, NH4 +, Ca+2, Mg+2, Cl−, Br−, I−, mesylate or tosylate. FI72998B (en) 1987-04-30 Hoegverkande vaetskeformigt tvaettmedel som goer textilerna mjuka samt foerfarande Foer Dess framstaellning.